Sundal is a very popular South Indian dish. 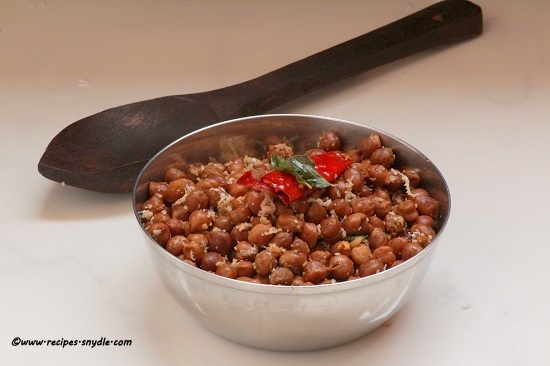 Chana sundal is a South Indian style sundal recipe made with black chick peas. It is often made during Navratri festivals. But apart from that, it can also be made and served as a guilt free snack. I always make sundal for my kids snack box as it is protein packed. This is one of the easiest sundal you can prepare for navratri. Sundal can be prepared using all kinds of legumes like chana, rajma, green peas and so on. Always take care to soak the legumes for 8 – 10 hours before cooking. Some legumes even need 12 hours of soaking time. So soak the legumes according to that. It is very easy to prepare sundal and is tasty and can also be served as a side dish. 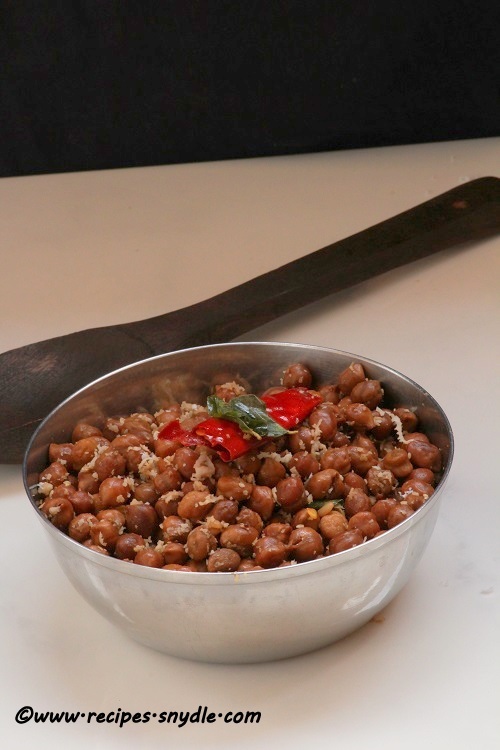 To prepare this sundal, soak the chana overnight. Once soaked, wash it well in clear water and pressure cook with enough water. I usually pressure cook for one whistle, and then reduce the flame and cook for 20 – 25 minutes. 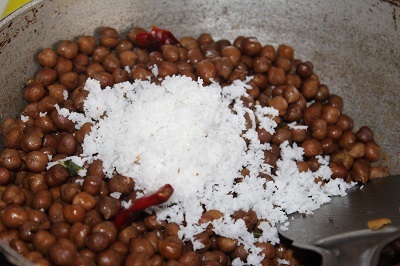 Finally, temper with mustard seeds, urad dal, add cooked chana and then add grated coconut. This dish is very easy to make, flavorful and healthy. It can be had as such on its own without any accompaniments. 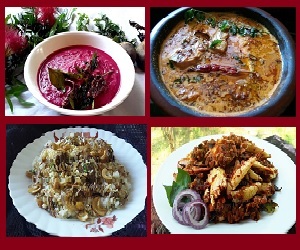 Sundal recipes are usually prepared during Ganesh chaturti festival, and also during navratri fasting periods. Navratri festival is celebrated for nine days. In most of the South Indian families, these nine days are considered to be very auspicious. In some families, people celebrate the festival by keeping an array of dolls called as Golu, and pooja is performed on those days. And various kinds of sundals are prepared as prasadam during those days. We don’t keep golu at home, but we make various kinds of sundals and do pooja on all those nine days. This kala chana sundal is one among them. 1. 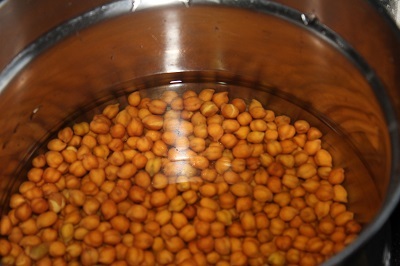 Wash and soak chana overnight or for 8 – 9 hours. 2. Drain the soaked water, wash the chana twice in clear water. Pressure cook for 1 whistle along with salt, and cook on low flame for 20 – 25 minutes or until chana gets cooked well. Let the pressure subside. 3. 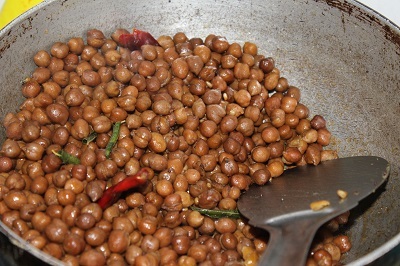 Drain the excess water from the cooked chana. 4. In a pan heat oil, splutter mustard seeds. 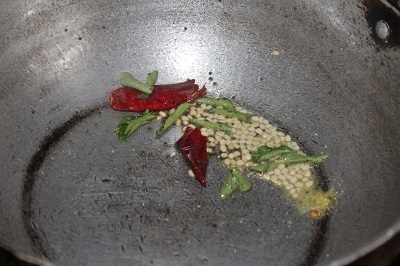 Add urad dal, dry red chili, curry leaves, hing. Saute for a second or till urad dal turns brownish in color. 5. Add the cooked chana, saute well till the entire water evaporates. 6. Add grated coconut, mix well and turn off the flame.